Rex Tillerson’s South China Sea comments just don’t make strategic sense. Secretary of State Rex Tillerson’s South China Sea comments during his confirmation hearings raised more than a few eyebrows. Tillerson seemed to suggest a blockade of newly constructed military installations in the SCS, an action that could, at the extreme, be seen as an act of war. Some attempted to explain away Tillerson’s comments as uninformed, or the result of a long day testifying before Congress. At Lawfare, however, international maritime law specialist James Kraska argued that Tillerson’s proposals had a strong foundation in maritime practice and might well represent good policy. According to Kraska, China’s disrespect for international maritime tradition and practice has created a situation in which the United States has legal justification to disregard China’s practice of traditional maritime rights, such as innocent passage. This would give the U.S. Navy cause to disrupt PLAN activities near the SCS islands, steps that would remain short of war or of formal blockade. But while it’s true that, in Kraska’s formulation, a policy of harassing and disrupting Chinese communications with islands in the South China Sea does not amount to a declaration of war, it also doesn’t seem to add up to a long-term strategy. The U.S. Navy surely can give the PLAN headaches as the latter maintains communications with its outposts in the South China Sea. The U.S. Navy cannot, as an operational matter, maintain a full blockade of those islands without resorting to violent measures designed to destroy Chinese ships and aircraft. Questions of the utility of such harassment thus become: What kind of end state is this strategy designed to establish? Does it change China’s interest in the SCS? Does it represent a sustainable way of increasing China’s costs? To prevent China’s expansion in the South China Sea, the United States needs to either convince China that the project is a bad idea in legal, political, or strategic terms, or that the expansion is too risky and expensive. A policy of harassing Chinese transit in the SCS seems deeply unlikely to accomplish the first; if the Chinese conclude that the United States is implacably hostile, they will likely have even more interest in militarizing the formations. Rather, the U.S. would rely on the hope that a China sufficiently annoyed by U.S. naval harassment would simply give up on the project, at least in the short term. This pits the USN against the PLAN in circumstances that strongly favor the latter. China has the advantage of nearby air and naval bases, plus an array of civilian and quasi-civilian vessels that it can use to maintain contact with SCS islands. The prospect that U.S. ships could have an operational impact on Chinese construction is virtually zero. Moreover, Chinese commanders might well welcome the opportunity to test and train their forces in quasi-hostile circumstances. Public opinion dynamics also militate against escalation. The Chinese public has far greater interest in the South China Sea than the American public, a situation driven both by the relative geographic positions of the antagonists and Chinese state-controlled media. While Communist Party leadership can easily draw a picture of the stakes in the SCS, the U.S. case necessarily relies on more abstract commitments to international law and maritime freedom, commitments unlikely to generate significant enthusiasm among the American public. And as Kraska admits, the strategy would run the risk of violent escalation, as American ships and planes would adopt a confrontational attitude toward their Chinese counterparts. However justified this attitude might be (and indeed, the PLAN has clearly behaved poorly in the recent past), it undoubtedly increase the chances that a commander on either side might miscalculate, resulting in a violent incident. Escalation is often worth the risk, but because in this case the upside is Chinese annoyance, the game hardly seems worth the candle. Finally, advocates might argue that a policy of harassment would at least have positive reputational gains; observers would at least see the United States doing something. 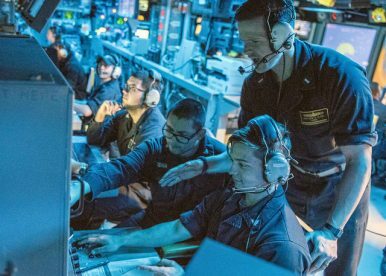 Unfortunately, what observers would almost certainly see is a Chinese victory; the dynamics of reputation formation are complex and controversial, but it’s unlikely that the U.S. would benefit from a high profile defeat on the high seas. In sum, simply because Tillerson’s comments do not mean war does not mean that they make good strategic sense. Inada reiterates Japan's standing policy to not involve its forces in the South China Sea beyond training missions.